Synopsis: The Odyssey has been heavily damaged by the Lucian Alliance and has been hijacked. SG-1 goes on a search for the ship but also walks into a trap. Now Cameron is the only one remaining and he has to find a way to infiltrate the Alliance in order to save the others. My Opinion: It was cool how Cameron managed to make them fight against each other. The relationships between the Lucians were well portrayed given the nature of this organization. Synopsis: Vala and Daniel believe that they've finally found the planet where Merlin's weapon is hidden. But when they arrive they learn that Ba'al has passed through three days ago. Additionally the warriors of the Ori arrive. The only way out is to find the way to the weapon. My Opinion: While they've been in the village I didn't suspect anything. But as soon as they left I began to mistrust that old man. I also noticed the ring he gave away, yet I couldn't have known what it represented. The riddles were good, although I knew at once that the fire would require a "leap of faith". Synopsis: The riddles are solved, now they have to face the dragon. But the weapon isn't there - instead they find Merlin. But Adria is closing in on them and time is running out. My Opinion: I liked the second part, too. But we have seen people who have been in stasis for several millennia or have endured in a sarcophagus. That makes it somewhat illogical that Merlin's stasis chamber couldn't stop the decay, I especially liked the scene where Sam punches Ba'al, that was really cool. 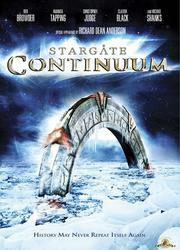 Synopsis: With the help of "Arthur's Mantle" SG-1 tries to hide an entire village from the Ori. But the field collapses and Sam gets heavily wounded. Vala is caught and meets her husband again who has become a brutal commander of the Ori forces. My Opinion: The interesting part of the episode is the question whether the Prior took matters into his own hands when he intended to destroy the village. His impressive staff couldn't help him to disable the device. On the other hand that could be a standard rule: if dangerous then destroy it and find an excuse in the "Book of Origin". Synopsis: Sam is accidentally catapulted into an alternate universe. There Atlantis has never been found, Landry is president and has declared martial law and the Ori are going to attack soon. Sam agrees to help them if she's allowed to return home after that. My Opinion: The very first alternate reality we've ever encountered (There But For the Grace of God was overrun by enemies. Yet almost always the people in these alternate realities were as noble as the ones in our world or they've been extremely desperate (Ripple Effect). This time we've actually seen a world where the people had to make hard choices but these choices changed them dramatically. That we aren't immune to this was proven in Absolute Power, still I am glad that Sam's back. Synopsis: SG-1 captures a Prior - it's Daniel. With the help of Merlin he was able to deceive Adria and could present to her a plan in which another plan is hidden. But for this to work SG-1 has to disable the Supergate - it all depends on whether Daniel is telling the truth. My Opinion: This episode was well written, until the very end the question of Daniel's allegiance had remained open. The Prior make-up did look cool on Daniel and I had fun seeing Jack again. I believe Daniel is in the lead again when it comes to the "race" against Jack on whose body had to endure more (implanted symbiote, ascended, knowledge of the Ancients loaded into the brain, rewritten DNA, ...). Synopsis: After SG-1 has sabotaged another crop transport, Netan of the Lucian Alliance puts a price on their heads. Although they are scattered all over the USA, they all have the same problem suddenly: bounty hunters. My Opinion: I liked this episode very much, too. Especially Vala who spiced up the class reunion considerably. And who could be surprised by the fact that she knew the bounty hunter. What I find interesting regarding series and movies is the fact that trains and busses either don't stop at all after they've ran something or someone over or they start to brake only after they've hit it. That leaves the question if they drive only by hearing. The bounty hunter was standing there for quite some time. I am of course aware that it is a stylistic device, but: A train that approaches a car standing on the tracks, blows a horn, runs the car over and drives away as if nothing had happened (Back to the Future III)?! Synopsis: SG-1 is arriving directly in a museum that is visited by members of the administration. They are immediately mistaken for rebels. After the shootings have stopped they find themselves in the roles of hostage-takers. My Opinion: Daniel shouldn't switch to taking hostages as a primary occupation that would be a very short career. Really cool was that Teal'c understood the cultural reference ("We've got ourselves a John McClane here.") better than Daniel. Such kind of knowledge doesn't find one in ancient egyptian scrolls. But I noticed that some of the team members aren't appearing for complete episodes. First Daniel has been gone for two episodes, then Teal'c and Vala haven't been seen in an episode and now Sam is away. On the other hand they have to create screen time for five people now. Synopsis: A summit of the free Jaffa was attacked and dozens have been killed. Teal'c and Bra'tac were heavily wounded. Teal'c finds out who is behind this - a Jaffa with whom Teal'c has to settle a score anyway. But this Jaffa threatens to attack Earth unless he is being left alone. My Opinion: I was afraid they would kill Bra'tac off, four episodes before the end of the show, he is about 143 years old after all. But the show isn't written by Joss Whedon, thus we can assume that everyone will survive. After Bra'tac had survived I didn't fear for Teal'c. But I didn't like the fact that this Jaffa, who has no honour, possessed a weapon that looked a lot like a Samurai Katana. Synopsis: The Tel'taks that are filled with Naqadah and were supposed to be used in the attack on Earth are still out there. And one is already hidden on Earth. But Vala's father knows where they are and he will reveal this information if he is granted asylum on Earth. My Opinion: This episode implied that Qetesh possessed Vala only for a few years because the difference in age between her and her father doesn't allow for much more (she didn't age while Qetesh was possessing her). But I didn't found the story that interesting. The meeting between Landry and his ex-wife on the other hand was nice. Synopsis: Adria is back in our galaxy and SG-1 plans to capture her. But Ba'al beats them to it and implants one of his Symbiote clones into her. Now he has access to her knowledge and he is preparing to take over the entire Ori fleet. My Opinion: Aside from the fact that the show is soon over, I really believe that this was the last Ba'al clone (why else would he kill all the others?) and it was cool that they've made a short rift of him. I also liked it (don't get me wrong!) that Vala was honestly hurt at the begin of the episode. That shows that she has build a real emotional bond to the team and Earth. Synopsis: The Asgard realized that their extinction is inevitable and they decide to obliterate themselves. But before that they transfer all their knowledge and technology to the Humans. But unfortunately exactly this technology makes the Odyssey detectable. Every time they return to normal space the Ori ships appear soon after. But there isn't enough time to disable the Asgard components until suddenly they have too much time at their hands. My Opinion: Great closing. Honestly. While the show was cancelled only after the airing of this episode, the end is quite suitable. The last conversation between Sam and Thor was really moving and that is quite an achievement given the fact that Thor is only a puppet/animation. I also liked the years on the ship but I believe I also would have gone up the walls like Cameron. The aging masks still didn't look real but they've come a long way since Jack's aging in Brief Candle. Teal'c is now 157 and thus 14 years older than Bra'tac. I am curious if they will consider this in future movies. After all, he's now over 50 years without symbiote. The Season - My Opinion: Now as it is over, it could have lasted longer. Vala and Cameron made a good addition and brought fresh blood into the show, after the Anubis arc had become a bit tiresome. 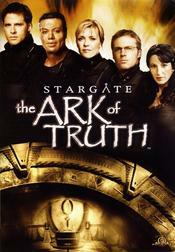 Luckily I still have Stargate: The Ark of Truth and Stargate: Continuum to watch. But I am still not too thrilled about Stargate: Atlantis. Still I think it was a good idea to end it at this point. In this season a number of ideas were used again and they also had several filler episodes. Synopsis: The Ori themselves are most likely dead. But their followers continue to fight. Daniel is now "sure" that they will find the "Ark of Truth" in the Ori galaxy. The Ark was build by the Ancients and is capable to show the truth about the Ori to every human being. Thus the Odyssey under the command of Mitchell is going to the Ori galaxy. My Opinion: On the one hand this movie was very exciting on the other hand several things annoyed me. In my opinion to the tenth season I said that they've re-used old ideas. Now they've done it again and they've even included a huge plot hole. It is most likely that the self-destruction code only works in combination with the Asgard computer core since the program was written in there. If the Odyssey would have been destroyed there would be nothing that could stop the Replicators. And the Replicator zombie was absurd. And Teal'c has been shot for the uncountableth time since the loss of his symbiote. An extra would lay motionless in the grass yet he travels over the mountains with an energy staff wound directly on the spine. And the Ori ships in Earth's solar system are graciously waiting with the attack until Daniel can convince them. That's it. 66 days (February 28th - May 3rd) of Stargate SG-1 are done. I hope you enjoyed to read it a little as I enjoyed to watch it again. Synopsis: SG-1 takes part in the ceremony where the last Ba'al clone gets his symbiont removed. The last of the System Lords is defeated. But something is happening. First Vala disappears, then Teal'c and then more and more people. Cameron, Sam and Daniel manage to get through the Stargate home but when they arrive on Earth everything has changed. The gate is somewhere in the arctic and Earth's history of the last 60 years seems to have changed. Another Ba'al clone has changed the past to win in the future. My Opinion: The elements of this story aren't new, not even to Stargate SG-1. A time travel after which the Stargate program doesn't exist also happened in Moebius. And the way the "ripple effect" changed the future didn't make much sense either. But I still liked this movie, it was nice to see them all again (Don S. Davis in his last appearance) and I liked how Daniel tried to speak to Daniel and how they once again joined forces with the First Prime Teal'c. Also this movie didn't have any lengths, it felt like a slightly longer regular episode even though it was twice as long.